A direct printer can print several thousand prints per day compared with the slower hand decorated transfer process. Dye Sublimation Print utilises special inks, printed onto the surface of a coated paper. 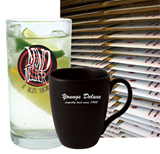 The paper releases (sublimates) the printed graphic when applied to a prepared surface of the mug and heated. Dye Sub, as it is affectionately known, uses organic dyes allowing a stunning combination of colours. 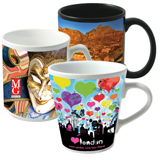 It is commonly used to print photographs onto our mugs, as well as complicated logos with full-colour designs. Dye Sub mugs are not subjected to a normal kiln-fire, and as such are not designed to withstand high-temperature harsh washing cycles. Hand-washing Dye Sub mugs is always recommended, or washing them on a low temperature cycle. Only certain shapes are available on this print method, as the receptive surface is specially coated and cannot be applied to all shapes. The design is silk-screen or litho printed onto special paper, then cover-coated. 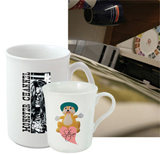 The resulting print is then treated as a water slide transfer and hand-applied to the mug. The process is slower and more labour intensive than direct screen printing but is more flexible with colours available and close registration guaranteed. Transfer printing is ideal for more complicated/intricate logos or designs. Printing is possible on the full side of a mug, inside the base, outside the base (known as a back-stamp), on the handle or inside the rim. 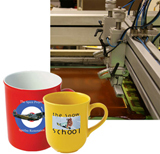 Unfortunately, combining Direct Screen Prints and Transfer Print processes is impossible, so if you want an unusual location for your logo, the whole mug has to be Transfer Printed. 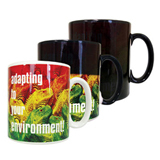 The mug is a standard Durham mug, which is then spray coated with a heat-change colour and printed with a dye sublimation image using organic colour. The result is a real talking point as the printed image literally comes to life before your eyes when a hot drink is poured in. We have two stock heat change coating colours. 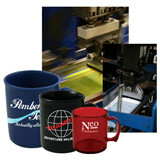 These mugs are great for promotions or simply reinforcing business relationships. Maybe your staff and clients are ‘the hottest team in the business’? Why not reward them with their very own special ‘heat change’ slogans to leap out at them every time they fill their mug. The organic colour is cured into the spray coating, unlike ceramic colour, which is fired into the glaze. Hence the need to avoid dishwasher or microwave use. The image is broken down into four essential colours – cyan, magenta, yellow and black (known as CMYK). Most creative software can store an image in CMYK format, but be careful as the monitor may not give a Pantone-accurate version of the image. It is best to send graphic files with a printed visual. Note that the magenta is not as strong as in paper printing, limiting the strength of reds and pinks. This can be overcome by using spot colours from extra screens. Additional spot colours are recommended to highlight text such as slogans or product names. An image is printed directly to a specially coated paper in process colour, using technology similar to an office laser printer. This is then cover-coated, becoming a water slide transfer which is applied to the ware. There are no screen costs, just an origination charge when the design is finalised. You can have one print or hundreds. As with full colour printing, there are limitations on the strengths of reds and pinks but, with pastels and citrus shades, the results are excellent. Because the inks are a natural product, perfect colour matching cannot be achieved on repeat orders and it is not possible to match the primary colour chart, but the technique is excellent for photographic slower, hand decorated transfer process.